MicroNova LLC is an electronics company based in Metro Detroit, Michigan. We provide innovative electronic design tools that enable engineers, students and hobbyists to create awesome things with FPGAs. I am delighted with my Micro-nova Mercury fpga development board, delivery was very efficient, considering I am located in the UK. I first encountered the Mercury board in a youtube video by Nick Williams, which closely follows the getting started tutorial on the Micro-nova site. I am running windows 10, and have had a few issues with Xilinx ISE Webpack software. Particularly with _pn.exe and xlcm licensing. Having overcome this issues by searching for solutions on the internet, I finally got the BlinkLEDs example VHDL code to compile. I then hit another issue with the MAP 258 error, this was related to a licensing issue, which I resolved by going to the Xilinx website and finding a solution. With my fingers and everything else crossed, I rerun generating programming file and waited with baited breadth. You can imagine my relief to see "build successful" message and a series of green ticks. Finally successfully produced a .bit file for the blinkLEDs code. Next to upload the .bit file to the Mercury board, which could not have been easier, worked without a hitch. 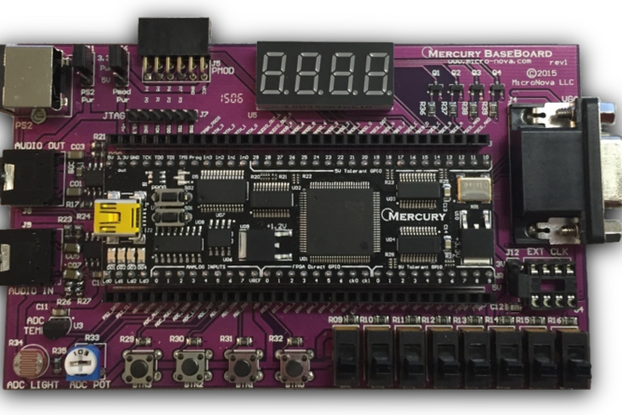 I am so pleased that I purchased the Mercury board and very much look forward to running through Nick Williams Lesson 2 and 3, examples to get to know the board and fpga projects. I particularly like the fact that you can use the board with breadboard, for prototyping, I also look forward to getting a copy of the Micro-Nova Base board to allow be to connect to peripherals. 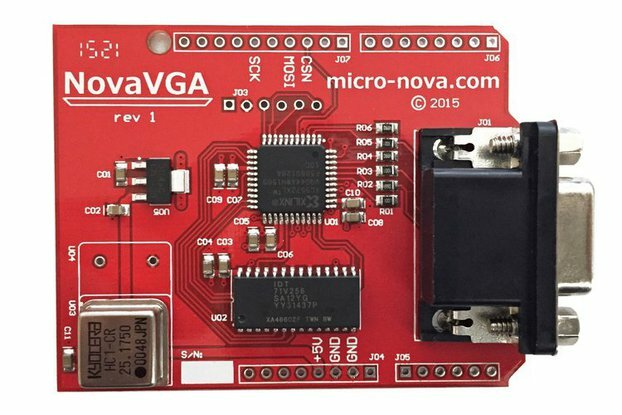 I have very little previous knowledge of VHDL or in working with fpga's, but have found the documentation on the Micro- Nova website very helpful and easy to follow. 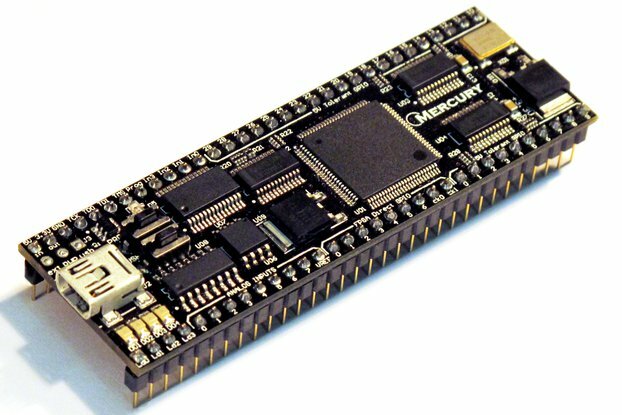 Anyone thinking off getting into fpga's then I highly recommend getting a Mercury board. I look forward to learning much more and creating some exciting projects with the Mercury Board. Micro-Nova, Mark Bowers thank you very much for opening up this very exciting field to the beginner/enthusiast. Nice product, fast shipping, and well documented, easy to use. it would be good if a mini usb cable can be provided, two faulty cables broke my whole day couldn't figure out the reasons. Awesome price for so many extra components for FPGA tinkering. Fast shipment, good documentation, excellent quality of board and board design. I bought that product because i want to get in to fpga programming. And with the starting guide its very easy to get the first program up and running. I recomend getting a book additionally to it which explains the basic structure and functionality of vhdl/verilog with xilinx fpga's. All in all im very happy with it and could recomend it to anyone who wants to get a decent fpga for prototyping. Also dont forget the baseboard which serves additional IO like switches and for more advanced projects interfaces like pmod vga and ps2. Without it you are limmited to the breadboards you have but certainly works too. This board is not only good for education as it is low cost, but also perfect for projects as its easy to insert to a PCB and it provides 5V tolerant pins. Great engineering, software is also simple to use. It is tiny which makes it even more charming. I've had some problems with the compiler settings, and the developer was more than happy to help me, which is also important to me. I greately recommend this board to anyone who's interested in FPGAs.